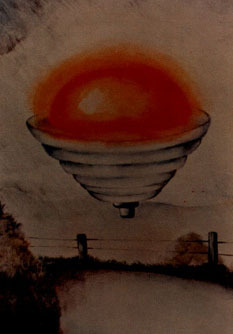 A disc-shaped object with dome was seem to light up valley as it landed one evening. The witness returned the next day and discovered a circle of scorched grass about 10m in diameter. Coral E. Lorenzen, the founder of the Aerial Phenomena Research Organization . Born in 1925, she was still a child of only nine when she saw what she would later understand was a UFO. The hemisphere-shaped object crossed the sky in an undulating movement. Three years later, she mentioned the sighting to her family doctor, who provided her with one of the books written by Charles Fort, an author who had collected tales such as that told by Lorenzen. RAAF pilot flying aircraft off the coast of Tasman Peninsula in 1942 spotted an unusual airfoil bronze colored craft 50 feet wide 150 feet long surrounded by a reflective dome. It kept pace with the RAAF pilot's aircraft before departing rapidly. Ghost Carlsson, Disc-shaped object with a cupola. The cupola seemed to be a cabin with oval windows. A shepherd was guarding his flock of sheep in an isolated grassy area when suddenly the animals scattered in a panic. He heard a rushing sound and saw a large metallic domed object emerge from what appeared to be an artificial fog and land nearby. George Stock was working in his yard on July 28, 1952 when this dome-shaped saucer appeared. George Gatay. Behind the being sat a dome-shaped object. A domed disc-shaped craft is reported to have landed within the White Sands Proving Ground, 12 miles west of Holloman AFB, Alamogordo, New Mexico, and 50 yards from highway 70. A bus driver and garbage man observe a "classical" silver flying saucer, complete with dome and portholes hovering fifty feet in the air over the playing fields in the center of the park. Mrs. Frederick. Two shiny beings, close-fitting garb, "opaque helmets," visible in dome of hovering disc-shaped craft. Actor Jaime Farr (M*A*S*H) driving down desert road. Caught sight of a light zigzagging across sky at incredible speed. Stopped in mid-air, hovered for a while, took off at high speed. The UFO approached within one hundred yards of car, then paced it. Could distinguish a domed apparatus with a light swinging around its base. The desert sand swirled underneath it. Charles Brew, Trevor Brew. The top section appeared to be a transparent dome of a glass-like material, from which protruded a two metre high mast or aerial. A disc-shaped, domed object was revealed hanging in mid-air in front of them. It had six brightly lit windows and was some 30 feet (9 meters) wide; metallic in appearance, it had a number of sections that were joined together with rivets and seams. The dome was also metallic, but it was darker and had no rivets. Mrs. Helen Reed. It was a typical domed disc with a flat bottom. When she first observed it the dome was glowing a soft blue. The object then moved erratically away from the barn and the dome turned a bright red orange in color. Dennis Crowe. In the distance, he began to see a glow, and as he moved closer, he could make out the shape of a disc-shaped object, sitting on legs on the sandy beach. Crowe guessed the object's diameter at 20 feet, and he could now see a glowing blue-green hue rim around it, with the craft's two parts a dullish gray. The top appeared to be a transparent dome. The disc shaped craft was sitting silently. The only sound he heard at the time was barking from some dogs. They were barking directly at the object. Crowe had made his first observations at several hundred feet, and as he came to within about 60 feet, the object lifted itself from the ground. Crowe could now hear a sound..a sound like air being forced out of f a balloon. Large disk with silvery-gray dome, about fifty feet in diameter and five feet high. Near the top of the dome were four small windows which emitted a yellow light. The area below the windows glowed with a bluish light. The outer ring between the blue light and the rim was rotating counterclockwise, casting off a halo of light that changed from orange to white with an overall tinge of blue and green. The rim itself was bright orange and did not rotate. An indentation was visible on one side of the UFO. Spaur described the UFO as approximately 50 feet wide, with a dome or some other superstructure barely visible on top. Neff-Spaur incident. Mr. and Mrs. Edward Vojtko. Encircling the rim was a row of red lights like a "rotating neon sign". The white light, much brighter than the red ones, was seen to be coming from a dome atop the structure. The object appeared as a typical flying saucer shape, smooth metallic in appearance, round, and domed on both the top and the bottom. Elizabeth Douglas. One humanoid visible inside disc with dome, square windows, as craft flew low past house. Ron Hyde. Two humanoids about five ft. tall, silvery suits, round helmets, emerged from disc with dome; one moved toward witness and gestured, he fled in fear). Marilyn Wilding. Two humanoid figures visible in disc with dome. The owner of the Lagoa Negra Fazenda, his wife and two children, and the Fazenda manager all saw a UFO that was disc shaped, about 9ft high and 30 ft wide, with a round hat shaped dome on top. Dr Irena Scott. CUFOS. DAI - America's photo reconnaissance spy satellite programs - Kehole and Talent. The object on the photograph was shaped like a saucer with a raised dome in the center. It appeared to be saucer-shaped with a dome [which] appeared to be quite tall in comparison to the brim - almost like a high top hat, or like the Kecksburb, Pennsylvania, object standing on end. M. Milakovic. Five silhouetted humanoids moving back and forth in dome of luminous UFO. A bright light shone into Mrs Leona Neilson's bedroom; on looking out, she saw a long shape on the snow with a dome and a 6 foot wide platform or rim around it, from which large multicolored sparks were flying across the river. She could see 2 men running around the rim, apparently both busy with something. The men were human-like, they were about 5 ft 8 inches tall, wore what appeared to be snow suits, and their heads were bare. They walked and worked like an average person, they appeared to be doing something near the dome. She called a friend, which watched with her for a half hour; then the sparks ceased, and the UFO went dark and was gone. Mr. Walter Hamady. Hamady described the object seen through, the binoculars as two saucers placed on top of each other with a perpendicular plane of windows that went all the way around the craft. There was a light inside that was not strange, simply looking like house lights at night, warm and yellow in appearance. On top of the craft, he said, was a dome also lit up in the same way as the windows. In back of it or in the lee of the direction it was moving were two lights. Hamady can no longer recall what color these lights were but his wife recalls that one was red and the other was green. There was no exhaust, noise or visible means of propulsion, and the movement was steady. The object proceeded steadily into the southeast, at about the speed of a propelior-driven aircraft, and disappeared from view. See line drawing of the Lebanon object by artist Brian James. The light was dotted around the cupola. It looked archaic, something out of Jules Verne, like a pickled metal, you know what I seen? When a piece of metal is heat treated, pickled, a burnished silver color? It looked like this, well you'd almost say you saw the rivets on the damned thing. Of course, I didn't seen any rivets. It was old-fashioned looking, not streamlined, (but) straight up and down, the cupola, with a little rolled edge on it. One "apelike" being, featureless, large waist, no neck, visible in dome-shaped object on or near the ground. October 19, 1973. Goshen, Ohio. Two or three 6-ft tall human-like beings moved around a domed disc resting on tripod legs, entered via ladder, took off with humming sound. June 25, 1974. St. Cyrille de Wendover, Quebec, Canada. Fifteen 6-ft.-tall robot-like beings, red lights on chests, floated from hovering domed disc with body lights; physical traces found at site. Domed disc with body lights. It was domed on top, emitted intense orange-yellow light. Beneath the dome, the UFO was silver in color. There was a wide band on which there could have been portholes, and six to eight horizontal bands below it, decreasing in diameter; their width was about 5 feet (1.5 meters) in all. At the bottom of the object was a small revolving disc, and below this what appeared to be a box or tube, which protruded from the base a short way. Witness reports observing an 80' domed disc over pine trees. Object hovers and emits a whistling sound. March 1975. Lexington, South Carolina. Mr. and Mrs. Jim Richardson. They noticed the UFO looked "like two pie pans" put together and had a dome on top. It flew about 40 to 50 feet above their car and it had red and blue lights on its ends and its dome was "brilliant white." The bottom of the UFO was octagonal in shape or like a stop sign. Jane Baker, Philip N. Baker family. She described it as a silvery disc-shaped object with a domed top which gave off a yellowish-white glow. Around its midsection were located red and green lights which were flashing on and off (see accompanying drawing). "Strange high-toned noises" , "metal-on-metal banging sound" , "loud boom." Jane Baker. The next morning, Jane went outside to see if she could find any traces from the previous night. She looked over toward the swamp near her home and saw the same or a similar object again — only this time there were no flashing lights or glow — but the shape and color were the same. It was hovering over some evergreen trees. Jane went back into the house to put on heavier clothing, then went back out, taking the family dog with her. She was proceeding toward the evergreens when the dog gave a big yelp and started to whine and paw at her ears. Then the dog became completely still. Jane says she didn't hear anything, but carried the dog into the house. When she came back out again, the object was gone. Silver disk shaped object with a soft white dome on top of it. Several red lights moving about its perimeter counterclockwise. I heard a strange, loud, metallic beeping sound. It sounded mechanical, like the pings of submarine sonar, and it had a peculiar rotational quality to it, like a Doppler effect. Described as two plates joined together with a small cupola on top. Domed disc with light, door and two windows, circle over two girls. Object gave off a beeping sound. At 2:00pm, Hirohito Tanaka saw a small dark circular-shaped UFO with a raised dome in the center. The object made a low pass over his neighbor's house. He grabbed his Instamatic 126, and took seven photographs. Their appeared to be a hump or dome on top of the object. Mrs. Gayle Rodriguez. It was shaped like an upside down saucer with a flat bottom and a dome on top in the middle. Near the bottom edge could be seen a row of individual lights which merged into a single blur when rotating. The lights changed color, alternating between blue, green and bright white. Atop the dome were three lights on the ends of which appeared to be antenna: two small white lights, and one larger red light. At 2:00pm on a witness who declines identification snapped a color photograph of a shiny circular disc-shaped metallic flying object that had a high raised cupola on its top side. It was flying high above the trees, and above the lower scattered puffy white cloud level, but well below a higher cirrus layer of thin clouds. The brushed-silver disc had a smooth unbroken lower surface and a three-tiered dome. The lower part of the dome had a red-orange color, with a light yellow colored part above that which was topped by a reddish-gold knob at the uppermost level. No seams, joints, ports or projections of any kind marred the unbroken finish of the shiny craft. Police officer Mark Coltrane took polaroid photographs of a metallic looking disc. His radio was emitting crackles at the time of sighting. Angelo D'Ambros. Two 3-1/2 to 4-ft. tall grotesque beings, yellow skin, prominent veins, huge ears, fang like teeth, from disc with dome, moved jerkily, seized pruning knife from witness, who felt an electric shock during struggle. Two humanoid beings, large heads, seen inside dome of luminous disc. When he went outside, he was astonished to see a domed disc with orange and blue lights gliding about ten feet above the ground. Hannah Roberts photograph of a discoid object in the sky. The lights now approached and stopped nearby, the witness could now see a dark metallic dome shaped craft behind the light. Now more lights turned on, on top of the hovering craft. The witness now felt hypnotized by the lights, she then had a floating sensation and felt drawn towards the craft. Here next recollection was of seeing the craft shoot straight up and disappear. Several 15-17 year olds were on their way to a discotheque in the town of Messel, 20 km south of the city of Frankfurt. At approximately 9:10 p.m. they observed three groups of lights consisting of four round lights flashing in different colors. Each group formed a square of 1.5° diameter at an altitude of about 30°. The first formation moved slowly and then stopped to hover in the air. The second formation displayed a slow movement as well; but the third group flew very fast over these formations and disappeared. After a few seconds the other formations moved away too. At that time the teenagers went into the discotheque. At about 9:30 p.m. they were called out by friends to see something strange in the sky. A few minutes later all of them observed a bright blue flash coming from the sky like a spotlight. Soon after that, a steel blue luminous disk with a dome on top appeared over the woods about 600 meters from where they where standing. It slowly approached the witnesses at very low altitude, a distance of about 100 meters. Its diameter was about 10 meters wide. The dome was divided into several multi-colored segments. Inside the dome, something rotated like a "beacon". On the edge of the dome the colors yellow, green and red appeared, one after the other. Near the edge of the disc were four square white lights arranged at equal distance from each other. On the bottom of the disc a bluish-white light radiated in non-regular intervals, creating a cone-like shape. After a few seconds the disc started to move in spiral curves down to the ground; it stopped for a moment before it flew away at a steep upward angle. The excited teenagers immediately called the police. When the police officers arrived the disk could no longer be seen, but several unusual lights over the woods were observed by the police officers, too. Source: International UFO Reporter, May-June 1984, p. 16. 8:05 PM. Five people in Llano, Texas, witnessed a huge dome-shaped UFO fly over their house at only 200 feet altitude. It made a loud humming noise and had lights on the rim. A jet aircraft was seen in pursuit of the UFO. The report & drawing suggests a hat shape or dome with a rim or brim, lights around the outside, approximately 300' from the witness. The object was described as a disc, with black dome on top (Exhibit 3J). There were orange, red, and blue lights on the bottom section. Within seconds, an object (saucer with top & bottom domes) proceeded to pass him. (Exhibit 4J). Danny Gordon, Roger Hall. It was very large, had a dome shape to the top of it, no wings, and what appeared to be strobe putting out multi-colored lights on the right side of the craft. Estimated size two football fields in diameter. Three huge picture windows in the back of it that were lit inside out. A red ball docked with the craft. Researcher John Ford says that federal agents have threatened at least three witnesses to the incident. Source: UFORN (UFO Research Network), St. Louis, MO, Barbara Becker. St. Louis, Missouri. Two witnesses on a balcony witnessed an OBOL (Orange Ball Of Light) in the east. Then, the object appeared in front of the witnesses, between buildings. It was described in the preliminary report as disc-shaped, without tapered edges, an orange dome on top, orange stripe around mid-section, and a black bottom with many blue lights underneath (Exhibit 4L). The witnesses ran into the street and watched the object fade westward. Total observation: 20-30 seconds. Klaas Rutanga. It shows a silver-metallic disc with a top. The light was now a domed metallic disc shaped object that now hovered above the witnesses. A bright white beam of light shone on one of the witnesses while the other ran and hid under the car. Multiple beams of light now circled the car. The domed disc now slid back a panel revealing two short humanoids, described as having gray wrinkled skin and claw-like hands. A third humanoid now appeared and moved with a mechanical like motion as he joined the other two. The dome then closed and the disc departed with the same jet-like roar. An unconfirmed account indicated that the nearby NASA facility at Wallops Island had lost its radar about the same time. A mother and her two young sons were resting in their home when they noticed a strange object hovering over a house across the street. The object was described as a domed gray disc with bright white windows around its circumference. Two separate groups of witnesses saw a low-flying circular plate. The first group reported they saw a cupola on the top. There were many lights on the object. A white domed disk-shaped craft that crossed the road in front of her at a distance of about 1,500 feet. Guillermo Arreguin. Daylight disc filmed during Mexico solar eclipse. He had heard a deep rumbling sound, ahead of him and above, and saw a huge black craft moving towards him, its body saucer-shaped, but with two bat-like wings, one on each side. It hovered about five minutes, close enough for the witness to see that the main fuselage had two decks and a dome on top. He could even make out a small figure, wearing some kind of helmet, through the windows on one of the decks. A silvery disc shaped craft with a dome on top descended on a cattle field besides the I-40 highway. Cem Arat and Mehmet Safak. UFO photograph. At an uncertain time at night, eastbound on I-64, just past US41 North, witnesses saw a large orange and red-domed disc with and eight-sided base. Duration was "a very short time" within 200 feet, seen through the windshield. After it passed the witness stopped and jumped out of the car but the object had disappeared. Investigation by James E. Delehanty, ASD (South). Mauro Diniz Brumana. Climbing over the neighbor's backyard wall he noticed a huge disc shaped object, around 10 meters in diameter, with bright red lights around the edge and a cupola on top that appeared to have landed on the neighbor's field. I made the picture full size & what "it" looks like is something with a dark bottom, a silver dome on top with the sunlight reflecting off of it the same angle that the sun was hitting us. An excellent photograph of a saucer shaped object with a visible top. Photo taken from a 3.5 mega pixel digital cam. On close examination there appears to be a silver or metallic disc shaped object in the middle of the photo. Now the reason I believe that this object is either silver or metallic as there appears to be an area on the object off which the sun appears to be reflecting. Photo taken from a Sony Cybershot digital camera. Eurico de Freitas and his wife Oralina Augusta. He said that a submarine was flying over the pasture, about the size of a small bus with round ends and a lump on the top. The investigators tried to compare the description given by Oralina, who had been so worried that night, that she went to join her husband by the window and also saw the object. She said that it looked like a large cigar and that the thing that could have possibly been a dome could not be seen very clearly. UFO spotted outside birthday party in Tatui, Brazil. Witness was awaken early at 1:30 AM by pet dog barking at something out side the a bed room window. Witness looked out window and saw a disk about 80 feet away hovering over a close-by artificial pond. The disk was observed through and just above the trees as shown in the graphic. The disk was approximately 30 feet in diameter and 15 feet thick. The dome on the craft was unlit.